This archive holds all posts form March 25, 2014. Today begins the third part of the Trouble with White Women series here at the RR blog. To briefly review where we’ve been, we started with Part I. White Women in the Early U.S., where we explored white women’s role in slavery, lynching, and the racial origins of early feminism. Then, we turned to Part II. The Professionalization of White Women, in which we explored some of the process of learning to be a white woman, the second wave of feminism, affirmative action, and just last week, the trouble with “leaning in” to corporate feminism. Part III takes up the issue of white women in American pop culture. White women dominate popular culture and the collective imagination about crime in ways that undermine our ability to grasp the reality of race and racism. There are so many examples of the representation of white women in popular culture, it’s difficult to narrow the discussion to just a few. Even though white women are seemingly everywhere in popular culture, their race, their whiteness, is rarely remarked upon. In Eat, Pray, Love a recent film based on the best-selling memoir by the same name, and starring Julia Roberts, an upper middle-class white woman leaves her husband, and sets out to travel the world in a journey of self-discovery. Although Roy names quite clearly the first-world privilege of this movie character, I would extend that analysis to include her race and her gender. While it’s possible to imagine a woman of color in the leading role, or even a (white) man in the leading role, it’s unlikely that such a film would have been produced had the lead been say, Tyson Beckford (lovely as he is). More to the point, if we’re engaged by this story of a white woman who struggles because she has “no passion, no spark, no faith” and needs to go away for one year, this raises the question (as Roy does) about where do people in Indonesia and India go away to when they lose their passion, spark and faith? It’s precisely because this is a white woman that producers believe that we as an audience will be interested in this story. The Sandra Bullock vehicle Blind Side is another example of the white woman as a central, racialized figure in a movie. As you may recall, the movie is based on the true story of a white woman who adopts an African American boy who comes from a poor family. I wrote about this moviewhen it came out last year and noted that it’s a version of the “white savior film” that many sociologists have studied. The film was a huge hit at the box office (grossing approximately$255 million dollars) and earned Sandra Bullock an Academy Award for Best Actress. It also seems to have prompted something of a life-imitating-art moment for Bullock who, shortly after the film – and her marriage – ended, adopted an African American child. The entire premise of the film Blind Side rests on the race and gender of the lead character; there’s no story here without the central fact that this is a white woman adopting a black child. Imagine a Tyler Perry production where Janet Jackson is the playing the lead and she takes in a poor, African American child. It might get produced (by Perry and maybe Oprah) but it’s not going to do $255 million at the box office and Ms. Jackson (lovely as she is) is not getting an Oscar nod. The whiteness of the lead female character is the sine qua non of theBlind Side. The appeal of white women as lead characters holds true in films produced outside Hollywood as well. The wildly popular Milliennium trilogy of books by the late Swedish journalist Stieg Larsson has been made into a series of films. In the first of these, The Girl with the Dragon Tattoo, down-on-his-luck journalist Mikael Blomkvist (Michael Nyqvist) joins forces with bisexual-computer-hacker-in-a-black-leather-jacket Lisbeth Salander (Noomi Rapace) to fight a ring of serial killer neo-Nazis (no seriously). The Lisbeth Salander character – both in print and on film – is being widely heralded as afeminist icon for the current era (although there’s some debate about whether the feminism in Larsson’s trilogy is weighed down by the heavy dose of sexual violence). The Salander character’s Otherness is marked through her bi-sexuality, yet she remains a “white savior.” As sociologist Matthew Hughey has noted about the classic white savior from a film of another era, Atticus Finch in To Kill a Mockingbird, Lisbeth Salander embodies a new white savior with a punk, quasi-feminist flair. One of the most telling, and damaging, ways that white women’s central place in the collective imagination shapes how we think about race and racism has to do with crime. The overwhelmingly majority of crime in the U.S. is intra-racial crime, that is crime committed against people by members of their own race. And, sadly, a disproportionate amount of crime that occurs is black-on-black crime. Our jails and prisons house some 2 million incarcerated people, the vast majority of those black and brown people. Yet, what consistently captures the collective imagination (and the news cycle) are white women who’ve gone missing. 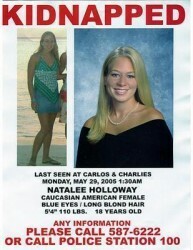 The undeniably tragic case of Natalee Holloway, who went missing while on vacation in Aruba, is just the most recent in a long line of missing white women who have captured the public’s attention, including: Polly Klaas, Chandra Levy, Elizabeth Smart, Laci Peterson, and Brianna Denison. This phenomenon is becoming so widely recognized that the Missing White Woman Syndrome now has its own wikipedia entry. As communications scholar Carol Liebler points out in a forthcoming article in Communication, Culture & Critique, the Missing White Woman Syndrome is also about middle-class status and perceived attractiveness. Conversely, when black women are victims of crime, the convergence of gender, race, and class oppressions in the news coverage tends to minimize the seriousness of the violence, portrays most African American women as stereotypic Jezebels whose lewd behavior provoked assault, and absolves the perpetrators of responsibility. (For more on this, see Meyers, “African American Women and Violence: Gender, Race, and Class in the News,” Critical Studies in Media Communication, Vol. 21, No. 2, June 2004, pp. 95–118). This fetishizing of white womanhood has expanded to childhood. There is perhaps no more telling example of our culture’s obsession with white femininity than the swirl of media attention around the death of JonBenét Ramsey. Her death should not be more newsworthy than that of another child because she was a white little girl with well-to-do parents. But it has been. As with the adult version of the Missing White Woman Syndrome, the Ramsey case brought together elements of race, gender and class. And, because the child had been involved in pageants, the case stirred up a lot of debate about the appropriateness of pageants for young girls and, among some feminists, concern about the sexualization of young girls. The sexualization of Ramsey was also racialized. Her success in beauty pageants was premised on her whiteness, as well as her overt sexualization. Why Does it Matter that White Women are Central to Popular Culture? The relentless focus on white women is a key part of the white racial frame. This frame undermines our ability to grasp the reality of race and racism. The Missing White Woman is a distraction. When our collective attention around crime is on the latest Missing White Woman, as tragic is that is for the individual family of that woman, what we’re not talking about is the mass incarceration and the establishment of a New Jim Crow that disproportionately affects black and brown people. White feminism, without attention to racial justice, makes an easy partnership with white supremacy. As I noted previously, white feminism – if it’s only focused on a kind of crude parity with (white) men – is not incompatible racism. In fact, many of the avowed white supremacist women I studied in Cyber Racism view themselves as feminists. And, there’s nothing inconsistent between white supremacy and white feminism. That’s why it’s so important for a critically engaged feminism include a committment to racial justice. White women hold a central place in the western, cultural imagination (for more on this point, see Vron Ware’s classic book, Beyond the Pale: White Women, Racism, and History, Verso Press, 1992). Yet, their whiteness often goes unremarked upon (for more on this point, see Ruth Frankenberg’s excellent book, from which this series of posts is borrowing a title,White Women, Race Matters, University of Minnesota Press, 1993).